With Issue 52 of The Letter, Tony Hughes has decided to hand over the role of Editor, a step that he takes reluctantly for health reasons. Happily for the Board, he will stay on as a corresponding editor, thus continuing his sympathetic and rigorous guidance and influence in an invaluable ‘backroom’ capacity. Over three years his editorship has seen the publication of nine stimulating Issues – 43 through 51. 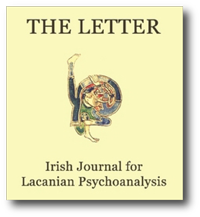 In a singularly important way, he fostered the blossoming in print of papers from members of the Irish School for Lacanian Psychoanalysis (ISLP). The publication of papers is a crucial formative step for members of ISLP, following on for the most part, from oral presentations made in the course of Intercartel Study Days that are held twice a year in Dublin. These papers, in turn, are the life-blood of The Letter and Tony has unstintingly overseen, championed and guided their publication during his tenure. For that we cannot thank him enough. And so, with the handing over of the helm, members of ISLP can be assured that The Letter continues on an unchanged course. This is reflectedin the fact that three papers from members of ISLP feature in this current issue 52, along with one further impressive and challenging chapter from Christian Fierens’ Lecture de L’Etourdit, Chapter Three of the First Turn: There is no sexual relationship. The printing in the next issue (Issue 53) of Chapter Four The Phallic Function and The Formulae of Sexuation and From One Turn to the Other will then complete the publication over three issues (51, 52 and 53) of the five sections of Fierens’ essential and remarkable guide to the First Turn of Lacan’s L’Etourdit, itself available in Issue 41 and at www.lacaninireland.com. THE LETTER 52 Spring 2013, pages 1-27. Chapter 1 was centred on the said as it operates in the master and academic discourses. Chapter 2 demonstrated saying in the scientificand psy-choanalytic discourses. Ab-sense separates these two chapters. On the one hand, saying ex-sists with respect to the said, does not belong to the dit-men-sion of truth and on the other hand the said is always only half-said, has no hold whatsoever on saying; impossible in the dit-mension, saying is demon-strated from the impossibility of the said. The rupture between the first and second chapters or the impossibility between said and saying will be put to work in the third chapter: there is no sexual relationship. THE LETTER 52 Spring 2013, pages 29-46. This paper will examine attitudes towards the mad and insane in early Irish society and explore the rationale for both their inclusion in and their exclu-sion from mainstream society. It will attempt to interpret a range of terms, now defunct, that indicated the characteristics of their illness. As no individ-ual case history survives, and since the mad were seldom afforded a signifcant role in the early literature, the investigation of the topic has to proceed obliquely. The material for it is in two parts. The first is formed from a composite of material, notably, legal, satirical and gnomic, from an amalgam of residual or interpolated material, dating from the seventh to the ninth centuries. However, much of the evidence is more suggestive than definitive.Furthermore, in most of it, the mentally ill are regarded as members of a social category, not as distinct human subjects. However, when Irish social and kingship theories are taken in conjunction with Buile Suibhne, hence-forth, The Frenzy of Sweeney, the text that grounds the second part of the investigation, their alliance brings the lived experience of a human being in crisis into focus for us. In preparation for the commentary on Sweeney, most of the general material selected will have direct relevance to his life. The ambiguity or pun in the title ‘God is now here’,‘God is no where‘ is entirely intentional as it explores Lacan’s subject engaged in the task of analysis depicted as a ‘negative ontology’ influenced by Hegels concept of ‘Begierde’ (Desire) and Heidegger’s concept of ‘Dasein’ (Being there) or alternately as a ‘negative theology’ where the later Lacan’s RSI facilitates a God of the Real which is neither of the Symbolic or the Imaginary. This article does not argue in an evidential way regarding the superiority of one position over another but argues that both have validity within a Lacanian reading where truth is a subjective ontological position rather than an objective epistemological position. Keywords: epistemology, ontology, Hegel, Heidegger, RSI, sinthome, lack. This paper arose from participation during the academic session 2013-2014, in an ISLP Cartel Group at Milltown studying Lacan’s (1974-5) Seminar XXII RSI and Seminar XXIII Joyce and the Sinthome (1975-6). In the latter seminar, James Joyce is studied as a subject for whom the instatement of the nom du père in inserting him into the symbolic was deficient. In a profoundsense Joyce’s writing was an attempt to make a name for himself, a name and a writing which would intrigue, baffle and confound future generationsof scholars. In addition to the cartel study, I also saw a patient for two years for whom the nom du père was not fulfilling its designation.When a severe trauma occurred in my patient’s middle life it provoked an existential crisis which his symbolic bulwarks were unable to contain. THE LETTER 52 Spring 2013, pages 57-77. The fact of repression is that a thought or knowledge solution is launched. Freud’s hysterics showed him that they suffered from reminiscences where things did not add up. A knowledge solution is the means by which we live our lives – of necessity, a fictional or lying means that masks/speaks the truth. This knowledge solution launches agency in the Other – again a fiction. Lacan’s radical formulation of the real makes for a very disconcerting disconnect between an agent Other e.g. God, mother, father, superego and a knowledge without a subject. And yet and yet… psychoanalysis takes place in the presence of a flesh and blood other, who refuses the demand of the analyser, grounded as this demand is on an acceptance by him or her of this very refusal – a ‘thy will be done’. For those who are committed to psycho-analysis, the question remains, what conditions such acceptance? Unwittingly, I realise, that for the past three years of my work in three separate cartels within ISLP, I have been preoccupied with the conceptual challenge posed by the big Other2 – particularly as Lacan speaks about it in the Seminar for 1968–69, Seminar XVI From an Other to the other. This preoccupation was given an unexpected boost by a teaching exercise in the academic session of 2011–12 where I had the opportunity to re-read Seminar V The Formations of the Unconscious delivered by Lacan some eleven years earlier in 1957–58.